Service Tax : Indian Institute of Technology (IIT) is set up by an Act of Parliament hence, it is Governmental Authority under para 2(s)(i) of Notification No. 25/2012-ST, even if Government does not hold 90 per cent or more equity/control in it; therefore, construction services provided to IIT are exempt under Entry 12(c) of Notification No. 25/2012-ST. (Shapoorji Paloonji & Company (P.) Ltd. – March 3, 2016). (viii) Master Circular on SHG-Bank Linkage Programme. 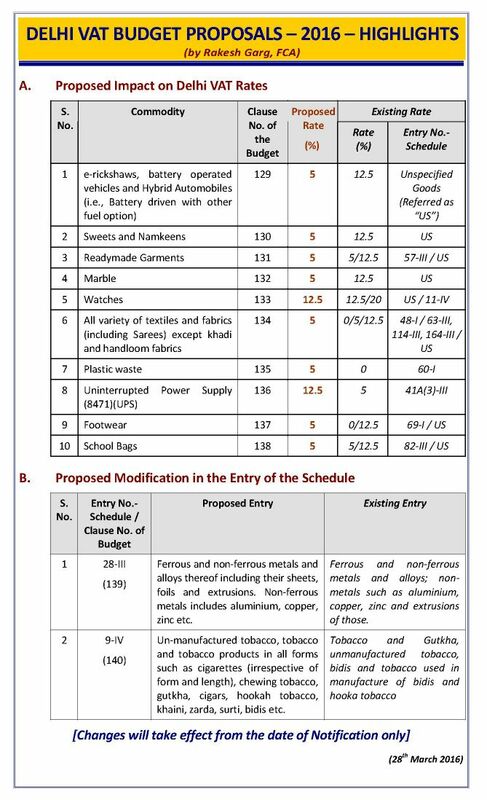 Due date for filing GE II for first three quarters extended to 15.03.2016. 2. Field relating to description of goods purchased made non mandatory. 3. Further clarification provided that purchases data shall not include procurements through work contract activities for which Govt. 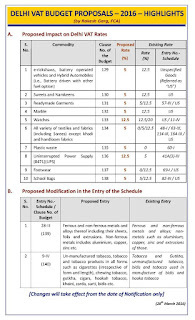 entities have to furnish details in DVAT 48. Fwd: Delhi VAT Tribunal - Division Bench - M/s JSW Steels Limited Vs. Commissioner of Trade Taxes, Delhi.. 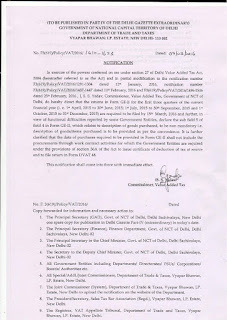 Please find attached herewith the Judgement of Delhi VAT Tribunal- Division Bench in case of M/s JSW Steels Limited Vs. Commissioner of Trade Taxes, Delhi. Date of Judgement -- 28-01-2016. Truck was intercepted on Mathura Road, near Ashram by VATO , Ward 89 and on the basis of the Statement of the Driver of the Truck, Tax and Penalty was imposed U/s 86(19). Tax & Penalty imposed by the Ld. VATO and upheld by the LD. OHA is hereby quashed and set aside and appeals are allowed. The Tax and penalty which have deposited by the Appellant , are ordered to be adjusted as the advance tax against the future liability of the appellant. 1. Hon`ble Delhi High Court has today set aside the assessments made by the enforcement officers on the ground that they are not the jurisdictional officers in terms of the Order dated 12.11.2013 issued by the Commissioner u/s 68 of DVAT Act. 2. Hon`ble High Court has also held the deployment orders issued by the Jt Commnr( Enf) for survey/search to be without the authority of law. 3. Hon`ble High Court also warned that no amount be collected in cash or otherwise by the survey team at the time of survey of the dealer's premise which if done would attract disciplinary action. For a copy of the Judgment please click here. 1. Due date for E-filing DP-1 Form extended to 31.3.16 Notn. No. 1559 dt. 1.3.16. 2. Due date for E-filing CST Form-9 extended to 31.3.16 Cir. No. 39 dt. 29.2.16. 3. 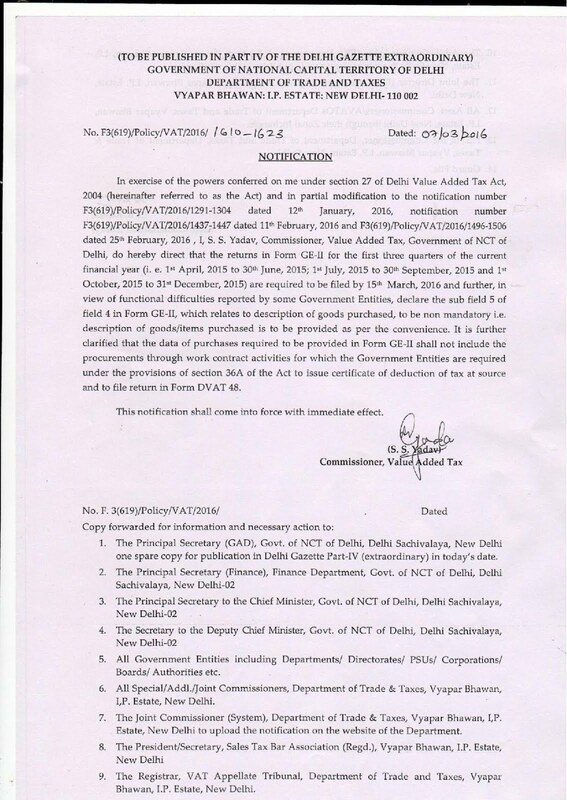 Due date for E-filing of CR-II for 1 to 3 Qtrs., 15-16 extended to 15.3.16 Notn. No. 1572 dt. 1.3.16. 4. Now Digital Signatures shall be Mandatory for filing DVAT returns w.e.f. 4th Qtr.,15-16 for dealers having turnover above 50 lakhs Notn. No. 1585 dt. 1.3.16.